blind men and elephant fish 맹인들과 코끼리 물고기: Frankenfish or simply the future? The Spill has a good review article about the recent controversy surrounding the impending approval by the FDA of the first genetically modified animal designed for human consumption. Its a salmon that grows many times faster than those found in the wild. I think the controversy is missing the point. The potential environmental gains from this Frankenfish are huge. Why? Well because this Frankenfish is so economical it can be raised in indoor, on-land, facilities. Why is this such a good thing from an environmental point of view? Well because we know longer have to raise the fish in offshore fish farms that pollute the water and allow escaped, farm-raised, fish to pollute wild salmon populations. Fish farming from an environmental point of view was a huge step in the right direction. It helped stop us from depleting wild fish populations. But then fish farms have pollution issues just like all other farms, i.e. too much poop and fertilizers/hormones. 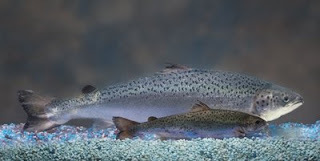 So the frankenfish will allow us to economically confine all that poop and fertilizers, taking it out of the oceans and lakes and putting it into purpose-built, on-land, "fish factories." Now whether or not we want to eat these factory-raised frankenfish is another question entirely. Personally I probably wouldn't mind. But from an environmental standpoint I don't see why old-school knee-jerk conservationists are crying (wolf) on this issue. Removing and confining our hazardous activities (fishing and fish farming) as far from nature as possible is unquestionably a good thing for those environments that we no longer need to utilize. It reminds me of the same debate over whether or not hunting safaris in Africa can/should be used to protect endangered species. Out where I live on Heuksando fish farming is a huge business and has been a livelihood saver for many fishermen who can no longer go hunting because fish stocks in the Yellow Sea are so depleted (or as they would say because the Chinese have kicked them out).